SHOOTING FOR LIFELONG SUCCESS IN THE MUSIC INDUSTRY? THEN GET YOUR COLLEGE EDUCATION AT MUSICIANS INSTITUTE! Today, there are hundreds of thousands of enormously talented college kids across the world dreaming of coming to Los Angeles to make their mark in the music biz. Taking math and English courses as part of their school’s liberal arts curriculum, they’re champing at the bit and biding their time before giving themselves an opportunity to conquer the world. Others are enrolled in music programs at big universities or at well-known music schools in scattered parts of the country—and can’t wait to finish so they can hightail it to Hollywood. But why wait? Why put off your dreams when you can earn a Bachelor’s Degree that prepares you for lifelong success in the music industry right in the heart of L.A., where everything is already popping? Since Musicians Institute (www.mi.edu) launched its world-renowned Bachelor of Music Program in 1994, the school has equipped hundreds of talented students for successful careers in a wide array of high-profile positions. MI alumni success stories are endless – they include professional touring musicians with superstar artists; thriving singer-songwriters; composers for film, television and stage musicals; members of the U.S. Army band; creators of music libraries for film and TV licensing, sound engineers and professional educators. What sets MI apart from the more traditional schools students might have on their short list? Associate Dean Gary Solt says, “What makes this program unique is that we’re able to take elements of traditional music and combine them with more contemporary styles and applications. You graduate with the skills to do more than be a music educator or audition for one of the few orchestra positions out there – you have the practical skills and versatility to make a living as a working musician. Our vision is to send our graduates out with the ability to have a long, fruitful career, not just a degree to hang on the wall. The extensive preparation that they put into their weekly performances and their final juries guarantees that they have professional-level live performance skills in a variety of styles including funk, Latin, rock, jazz and classical music. Another compelling reason to consider a college education at MI recalls that old real estate industry mantra: Location, location, location! The intensive 180-unit Bachelor Program at MI comprises four basic areas: instrument studies (with majors in Guitar, Bass, Drums, Keyboards and Voice), supportive music courses, general education and electives. Students audition and enter the program with their major instrument already chosen, so they begin immediately with a mix of private instruction and classes in ensemble, reading, instrument study and the aforementioned required performance juries where students combine their skills and knowledge as they assemble bands, rehearse, arrange and perform musical selections from a variety of different musical genres in a concert-hall setting. These performances are filmed, recorded, and judged by a panel of MI instructors and industry notables. The Supportive Music element of the program includes courses in such essential areas as music theory, ear training, audio recording, music history, music business, computer applications, music teaching, keyboard skills, arranging and conducting. These studies are undertaken in depth—the program has eight levels of theory, for example, that merge classical and popular music-based musical analysis. Students engage in an equal measure of ear training, learning to apply their skills to deconstructing the tunes they play in ensembles. Elective courses give students options to both deepen and broaden their skills, such as a vocalist who wants to learn bass, a drummer who wants to sing, a guitarist who wants to shore up his or her MIDI or computer knowledge. 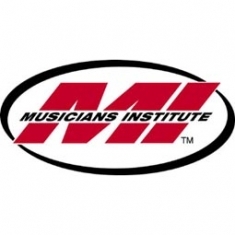 Despite its success in priming over 20,000 musicians, producers, engineers, vocalists and music industry professionals for careers in every contemporary genre of music— rock, funk, R&B, hip-hop, jazz, blues, and fusion, among others— Musicians Institute (MI) is still one of the best kept secrets in the music education field. Located in the heart of Hollywood , just blocks from the Capitol Records tower, MI has an incredible history of innovation dating back to its origins in 1977 as the Guitar Institute of Technology (GIT), which broke new ground as a performance-based contemporary music school taught by working professionals. Within a few years, GIT was joined by bass and drum programs to form Musicians Institute and the evolution has continued to this day with degree and certificate programs for career-minded guitarists, bassists, drummers, vocalists, keyboardists, recording engineers, independent producers, guitar makers, music business professionals and filmmakers. The best measure of MI’s success is the graduates themselves. The list of former students who have achieved success in the “real world” is long and colorful. MI alumni don’t just appear on the covers of music magazines, they fill the pages in between. Those who have passed through MI’s halls before going on to achieve notable careers include Keb ‘Mo; Weezer guitarists Rivers Cuomo and Brian Bell; longtime Chick Corea guitarist and fusion giant Frank Gambale; Chad Smith and John Frusciante of the Red Hot Chili Peppers, drummer Curt Bisquera (Elton John, Mick Jagger, Bonnie Raitt); guitarist Fred Clark (Chaka Khan, Ray Charles, Stevie Wonder); guitarist/producer John Shanks (Melissa Etheridge); the late Jeff Buckley; singer Angela Ammons, and recently former American Idol finalist LaToya London, who has just released her debut on Peak Records. MI’s international reputation as a leader in contemporary education is based on four key factors, implemented by the school’s more than 120 pro instructors: 1) performance-based education, with practical, interactive instruction by working professionals in the classroom, onstage and in the studio; 2) intensive learning, including a fast-paced application-oriented curriculum that cuts quickly to the core of each subject; 3) an environment that encourages the expression of creative diversity and personal style; and 4) career development via programs that prepare students for the realities of highly competitive professions. MI has expanded far beyond its roots as an instrument performance school and now offers specialized programs including the Guitar Craft Academy , which trains a new wave of guitar makers and technicians for the thriving instrument industry; the Music Business Program, focused on educating aspiring industry professionals; and the new Film Institute of Technology, which brings MI-style hands-on training to music video and commercial production. MI has also expanded academically. Instrument students now have a choice of earning Bachelor of Music and Associate of Arts degrees as well as certificates. The latest offering is an AA program combining guitar, bass, drum, keyboard or vocal studies with a Music Business emphasis to turn out graduates who can truly fend for themselves in a challenging industry. “What sets MI apart from most of America ‘s standard college music programs is that we take contemporary music seriously, and we combine all of the elements of a contemporary music education in one place,” says Keith Wyatt, MI’s VP of Programs. “We were training students in contemporary music back when it wasn’t considered a serious course of study. Electric guitar was the first instrument we offered and it remains our largest program, but to this day, most colleges still treat it as a second-class instrument because it doesn’t fit into the classical or traditional jazz repertoire. MI’s location in the center of Hollywood is a key part of the equation, training students for contemporary music careers in the very heart of the contemporary music industry. One-of-a-kind facilities tucked just off Hollywood Boulevard surround students with professional tools and atmosphere including top-of-the-line recording studios, an array of project studios, dozens of workstations, HD editing systems, a 500-seat concert facility and a wide variety of performance stages, class-rehearsal rooms and practice labs. For more information on Musicians Institute, please visit www.mi.edu or call 800-255-7529 .